I regret to inform you that winter is not, in fact, over. A powerful storm is set to spin up in the Midwest this week. And if you’re getting deja vu looking at the weather map up top, you’re not alone. 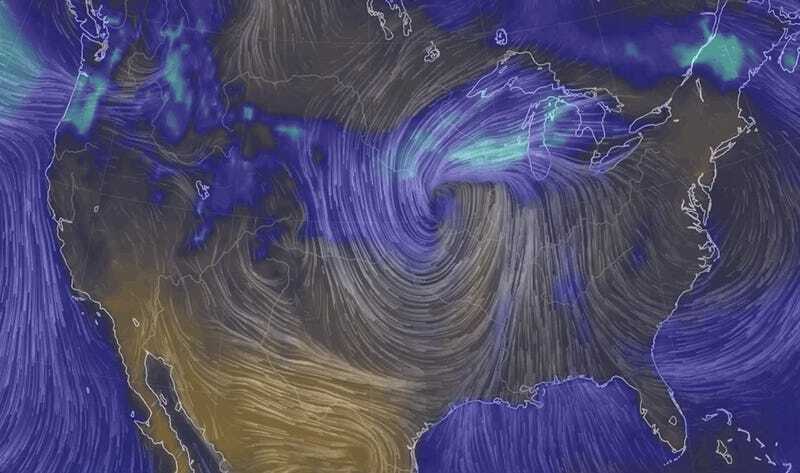 The swirling mass of air forecast to blast the region with blustery winds, snow, and rain bears more than a passing resemblance to last month’s bomb cyclone that devastated the region. While this week’s storm might not be quite as strong, it will unleash a wave of misery in places still suffering from flooding. The gnarly weather pattern will follow a similar evolution to last month’s bomb cyclone. A storm will come racing on the back of a strong jet stream dipping across the west through the first half of the week. As the jet stream swoops back up into the Midwest on Wednesday, it will pull ample moisture from the Gulf of Mexico up to meet cold air from the north. Wyoming, Nebraska, South Dakota, and Minnesota are all under winter storm watches. The contrasting air temperatures will have winds whipping up to 35 mph and six or more inches of snow are forecast, according to the National Weather Service. Other parts of the Upper Midwest could also see snow through Thursday before the storm swirls into the Ohio River Valley, and it’s extremely likely those winter storm watches could expand to other areas and be upgraded to warnings. Blizzard-like conditions are also possible, so it wouldn’t be wholly shocking to see the National Weather Service issue blizzard warnings at some point either. While the storm is no joke, it’s also not likely to be quite as potent as last month’s bomb cyclone, which arrived with hurricane-force winds and record-setting low pressure. That’s because the environment isn’t as conducive to as powerful a storm this time around. The temperature gradient on either side of the front—a key ingredient for winter storms to “bomb out”—won’t be as extreme. That means this storm might not meet the textbook definition of a bomb cyclone, a term that applies to storms that see their central pressure drop 24 millibars in 24 hours. But textbook definitions aside, this storm poses a serious risk to the region still recovering from flooding last month. Data kept by the National Oceanic and Atmospheric Administration (NOAA) shows that Midwest soil moisture levels are in the 99th percentile, which is to say that soils are extremely waterlogged. The new batch of rain and snow is like pouring a can of gas on a fire. Except instead of the flames rising higher, the water will. If you’re wondering what climate change looks like, this is it. A warmer atmosphere can hold more water, unleashing more deluges and with them, more floods. With saturated soil, water is once again expected to run off into rivers and streams, many of which are still swollen. In the Missouri River basin, 26 flood gauges in NOAA’s network are in a state of major or moderate flooding. In the Upper Mississippi basin, 56 gauges are at those levels of flooding. The new influx of water will add to the flood woes and is likely to tip other gauges back toward moderate or major flooding. That could add to the billions of dollars in losses and once again raise the specter of flooding at Superfund sites. And it will add to the slow moving torrent of water working down the Mississippi River toward the Gulf of Mexico. That wall of water is forecast to unleash historic flooding through May, according to NOAA.